I have written my U2 memoir, On the Road with U2 – my musical journey. It is about my adventures since 1992 on the U2 tours from ZooTV to 360, including all 75 concerts, the people I’ve met, the places I’ve seen and my quest to meet Larry. It has been a wonderful journey, both living it and reliving it while writing about it. 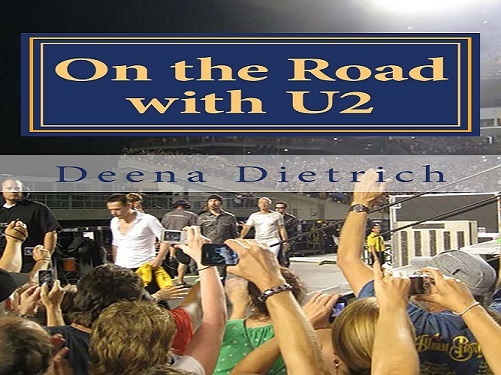 Click here to buy On the Road with U2 on Amazon in paperback or kindle version. If you don’t have an amazon account or don’t want to get one, you can buy my book straight from the publisher here at the same price. There are many books about U2, in fact amazon.com lists over 5000 U2 books. Most of the U2 books are biographies about the band, some are written by fans about their own U2 experiences, but I think I am the only one who has written a U2 book with a Larry Mullen theme. Follow me on twitter @OnTheRoadWithU2 as I continue my musical journey on the the road with U2. I recently went to 15 shows on the iNNONCENCE + eXPERIENCE tour in in Vancouver, Denver, Chicago and New York City bringing my grand total to 90 U2 shows – and I finally met Larry and got my picture taken with him and gave him a copy of my book! Thank you SO much! Working on finishing it now. Should be available on amazon before the tour starts in may. And i will also have copies with me on your in vancouer, chicago and nyc. it must have been a wonderful experience, three months driving across the USA on your own personal U2 tour. I’m sure you’ll have great stories to tell in your book. I hope you’ll find a publisher. My book will be published in the USA by American Bookstore, who made a deal with my Dutch publisher. Good luck. That’s great! Thank you so much! I will most likely self publish on amazon in May. Good luck with your book! An amazing book and a must read for all U2 fans!!! Beautifully written and very imaginative!!! She makes you feel as if your with her throughout her whole experience!!! Well done Deena!!!! Many blessings!!! Thanks for reading and commenting and posting about my book Vicky. I really appreciate it! http://www.amazon.com/On-Road-U2-musical-journey/dp/0692422994/ Congrats again to Deena!!! This is a great book and a must read for all U2 fans!!! Beautifully written and very imaginative!!! She makes you feel as if you were there right with her!!! Great job and many blessings Deena!!! Not quite sure what you’re saying but thanks for reading and thanks for getting my book! Hope you like it.